In between colorful posted images was a plain and concise post from a former manager and all around great guy from my stint at Hewlett-Packard. Ron does as many of my friends do and posts a call for help on Facebook; specifically looking for anyone with Photoshop experience. The Enter key clicks, the mouse wheel creaks as more innocuous content floats up my screen. Not long after, I receive a private message from Ron detailing the project. He and Julie have a longstanding history of making hilarious family Christmas Cards that truly show how close they all are. We end up having a 20 minute phone call to discuss the details. It turns out that this year they want to out do the previous cards exponentially in the creativity department. They want to have themselves depicted as action figures. Action Figures… in packaging. Wow! This is a totally awesome concept and should come out great with the right effort. This also means quite a bit of work as this is no simple task. And with a deadline of 3 weeks from the starting gun, it’s a super ambitious project especially as I had never done this kind of treatment before in the years I have been working with Photoshop. What the Hell? I’ll throw my hat in the ring and give Ron and Julie my estimate of 30 hours. They gave me the green light. First thing’s first… we need source material to work with. Ron, Julie and their daughter Rachel are down in Florida. Their son Mitchell is an hour east of me in Connecticut. So getting everyone together for a photo shoot is out of the question. I do my best to explain to them how to shoot each person so we can make this work. I suggest setting up a white sheet so it is hanging vertically and also spills out onto the floor. Point as much light as you can toward the sheet from all sides. Then have the subject stand on the sheet. With that, I can mask out the person in Photoshop and then go to town converting them into an action figure. 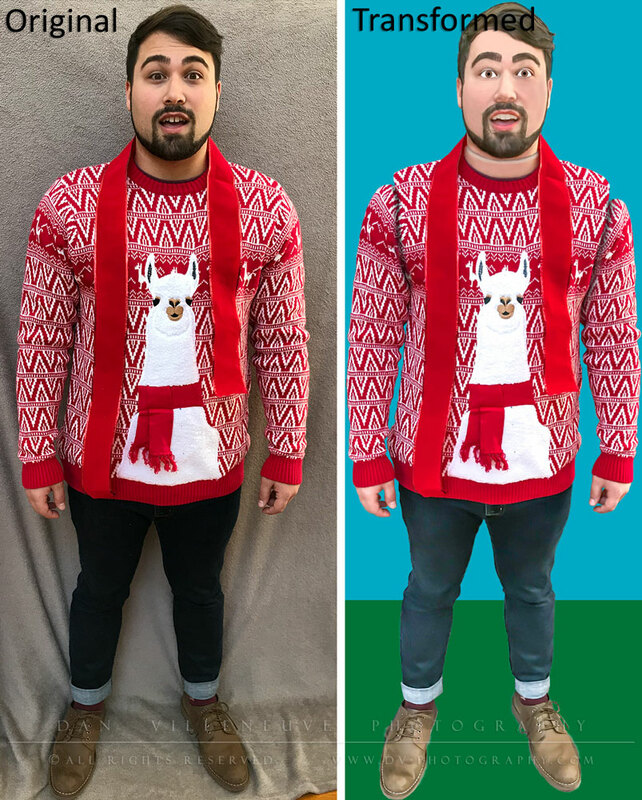 My plan is to leverage Photoshop’s ability to place linked images into a Photoshop file. 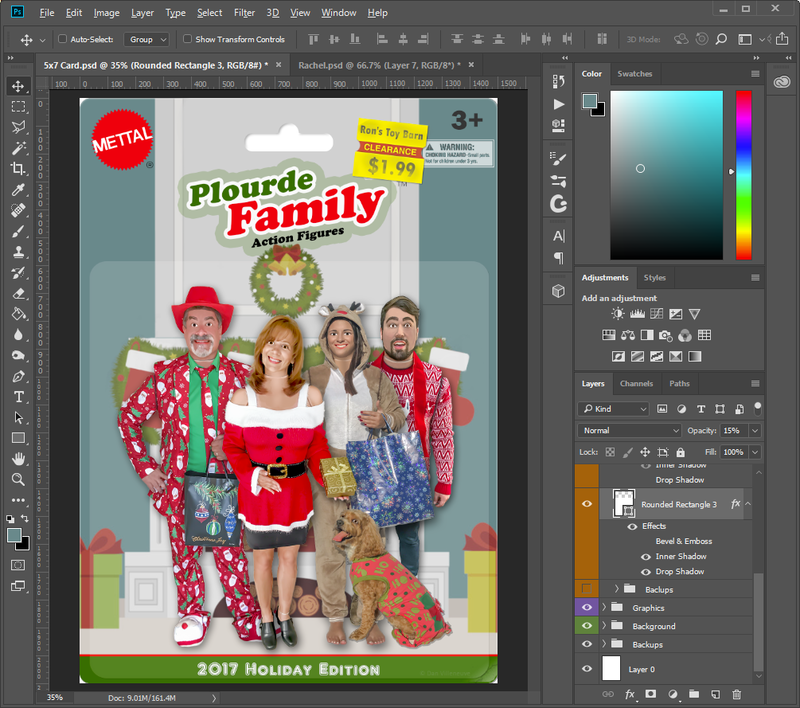 So take each person’s image, edit them in separate Photoshop files, then merge them into a master Photoshop file to pull everything together; individual action figures, packaging, effects, text, etc. This is extremely helpful when you need to make changes to one particular aspect of the composite and you don’t want to have to sift through hundreds of layers. Plus, when you edit the linked Photoshop file, the image in the master Photoshop file gets automatically updated with the saves. Ultimately, it’s a huge time saver and makes edits super easy. The first picture I receive is of their daughter Rachel. I do a quick pass in Adobe Camera RAW to “flatten” the dynamic range (reduce highlights and shadows and focus on mid-tones) on the overall image. I also apply a heavy amount of noise reduction and masked sharpening with minimal exposure to add to the plastic effect. 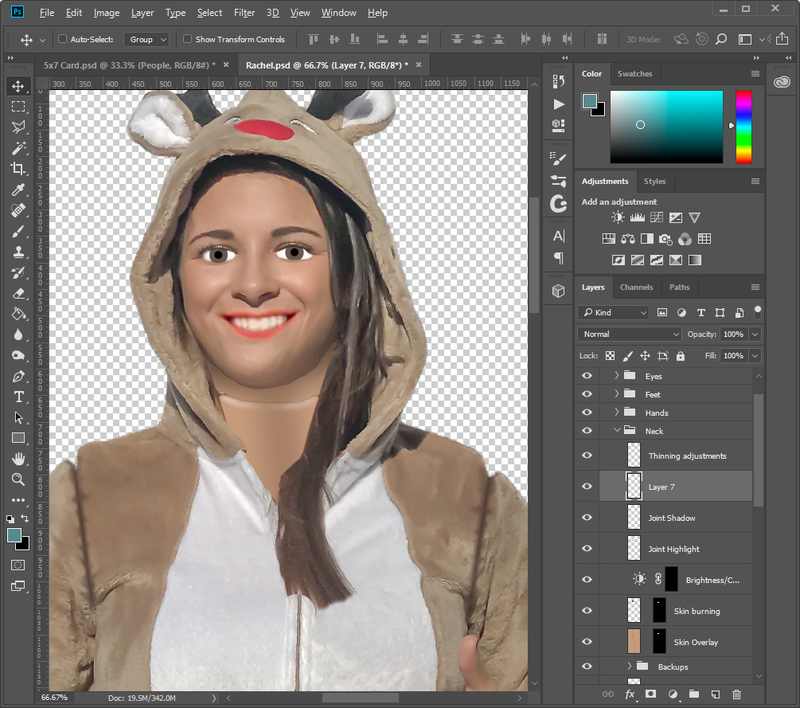 From there, I open the image in Photoshop and use the new “Select and Mask” tool to remove the background (sheet and shadows) to leave me with just the person. In the original picture, Rachel is squinting because she is facing the sun. As with most action figures, the eyes are painted on with a pretty standard “2,000 yard” stare which is to me, a tad creepy. So I estimate how large the whites and pupils should be and paint them in. Also, she is not smiling with an open mouth. Luckily Julie sends me another picture with her smiling. 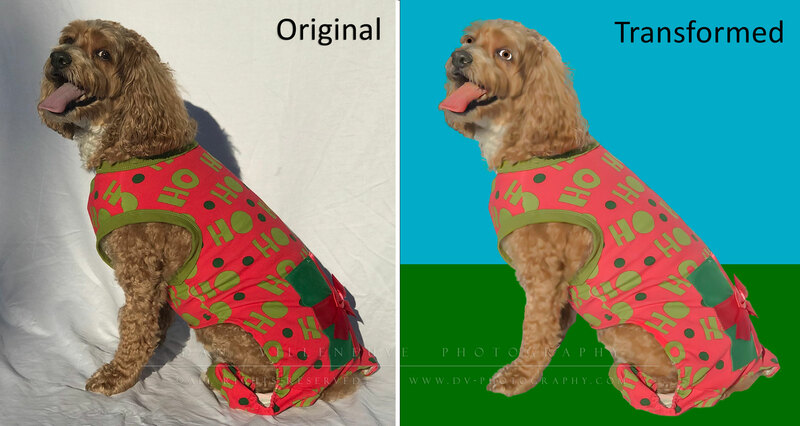 I am able to overlay and scale that smile on top of the desired image. The lips get their own accentuation by saturating the red portions and over-whitening the teeth, replicating that hand painted look. To make the skin look more plastic, I sample an average skin tone from the image and then paint in the areas of the face, neck and chest. 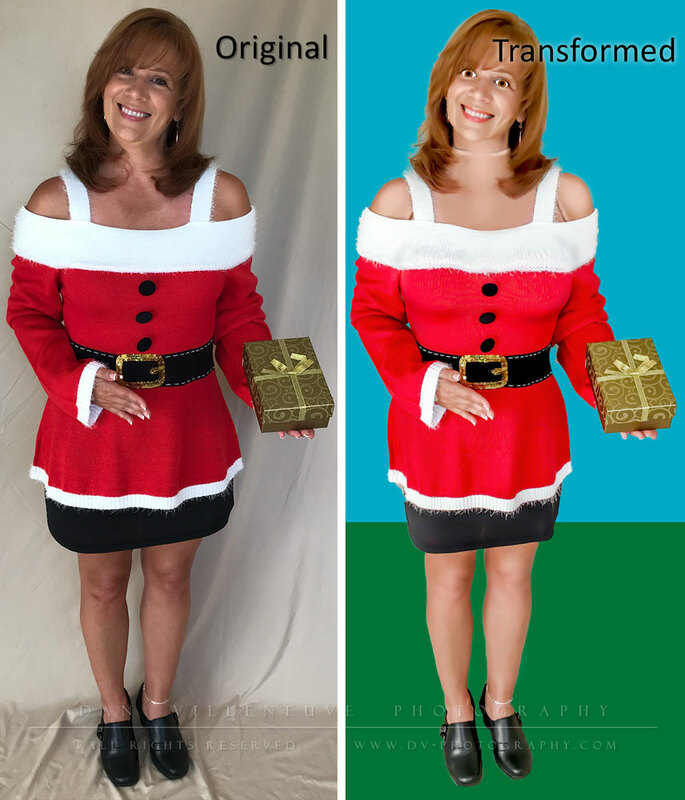 For the hands, and other prominent features, I use the blur tool to reduce any wrinkles or shadows. Each of these changes are done in separate layers so I can easily come back and make edits. A view of how the neck socket and face looks. 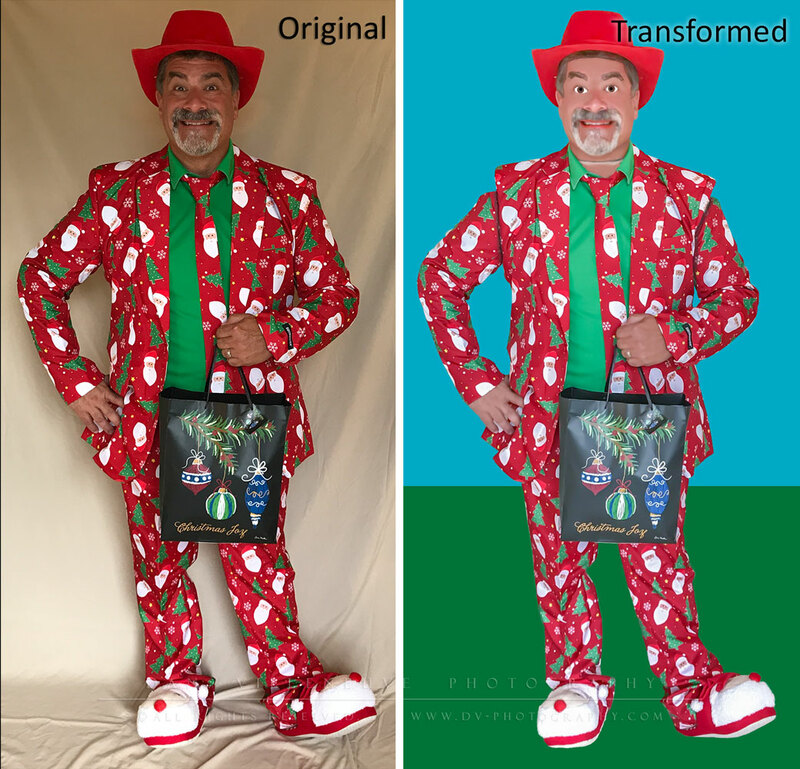 I send Ron and Julie a copy of the transformed image as a review draft. They happily approve the direction and let me know they are looking forward to seeing more updates. Excellent! So now we need to put everything into context. This means getting the packaging together and incorporating the figures. I start with a new Photoshop file set to 5″x7″ at 300dpi and add vector based background that I can use in a scaled format as a base image to work from. We give it a 3D look by masking in rounded corners and adding a subtle drop shadow and embossing. I then add each of the action figures using the “Place linked” option from the file menu and scale and position as needed. When scaling and positioning, we need to do this while keeping in mind that we need enough margin from the edges to allow us to later add in the plastic overlay. 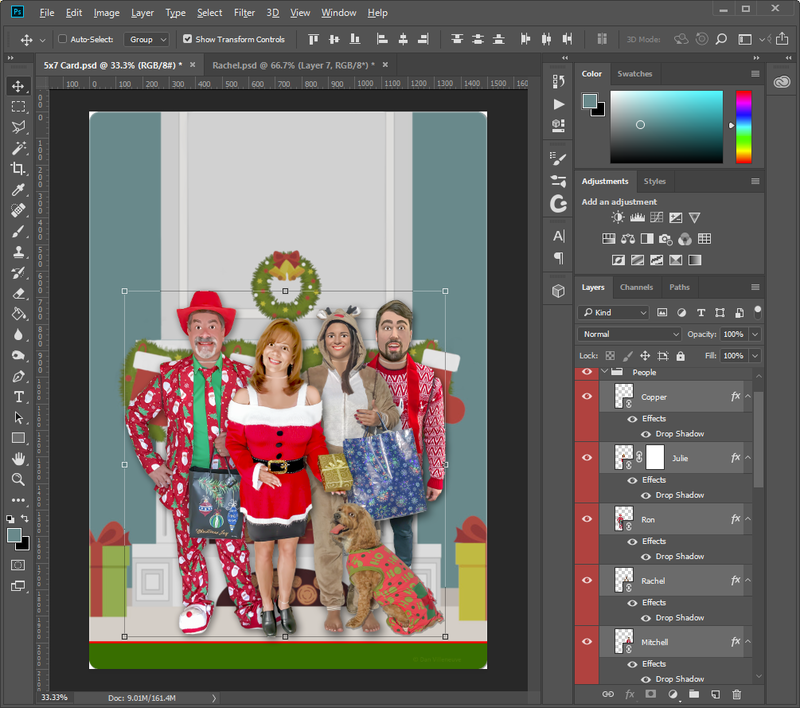 A drop shadow gets added to each figure to add some depth. Adding each of the action figures to the card backer. From there we start adding subtle features that will help sell this as an actual package. We add a hole punch out for the peg display as well as a crease in the lower right corner to give the feel of having been handled. Emulating a bent corner crease. Adding a title block supports the context of the theme. For this, a fun font is selected (Cooper Black in this case) using Christmas colors and a couple sets of stroke FX to the group with careful positioning gives us our end result. Also throw in the “TM” to add to a marketing feel. Ron mentions that he wants the “Mattel” company logo on the packaging as well. I decide to tweak it a bit as a parody to hopefully get around potential Registered trademark issues. And what toy packaging wouldn’t be complete without an age suggestion, choking hazard warning block and a smudged clearance price tag? To create the used look of the clearance tag, I create a yellow rectangle as the base. Next comes the red bar with “CLEARANCE” font (desaturated a bit). 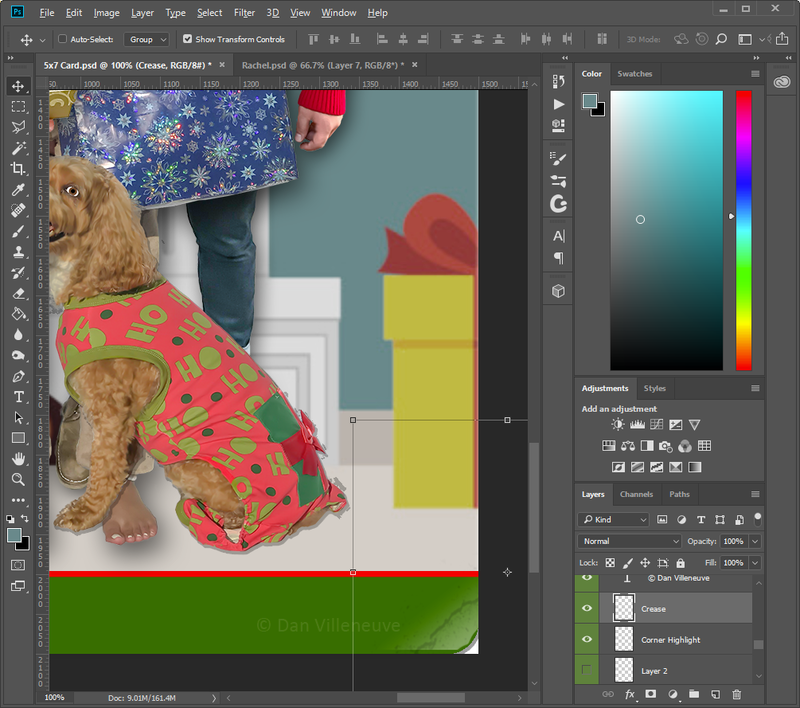 Using a hard edge eraser tool, I create the cutouts on the sides and merge the layers to consolidate things. 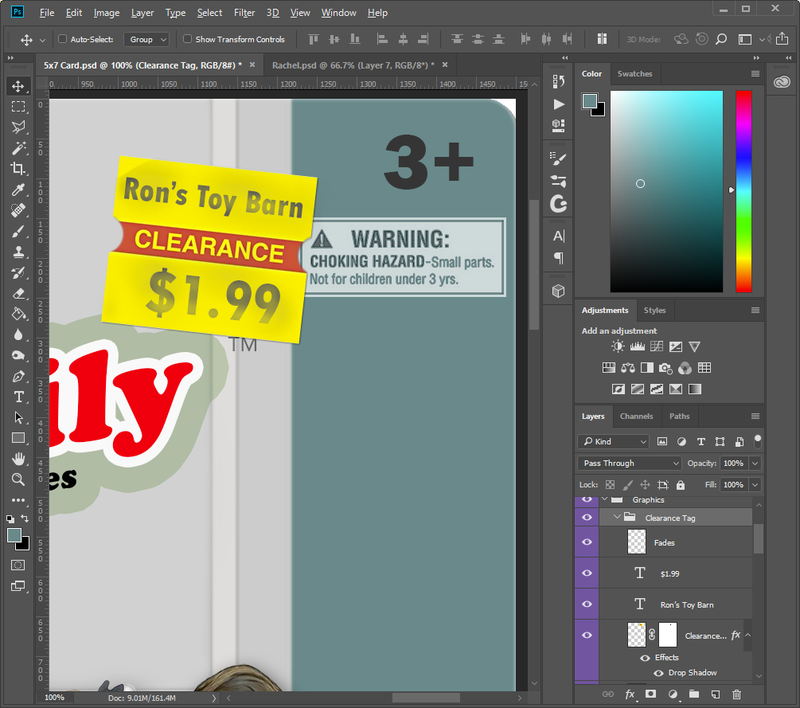 Next, I add the “Ron’s Toy Barn” and “$1.99” text in a charcoal gray font. Then in the “Fades” layer, I lightly airbrush the smudges in the same charcoal color with a 20% flow. To emulate the ink not being even, I then change the airbrush color to the same yellow as the original rectangle and judiciously airbrush over the font. 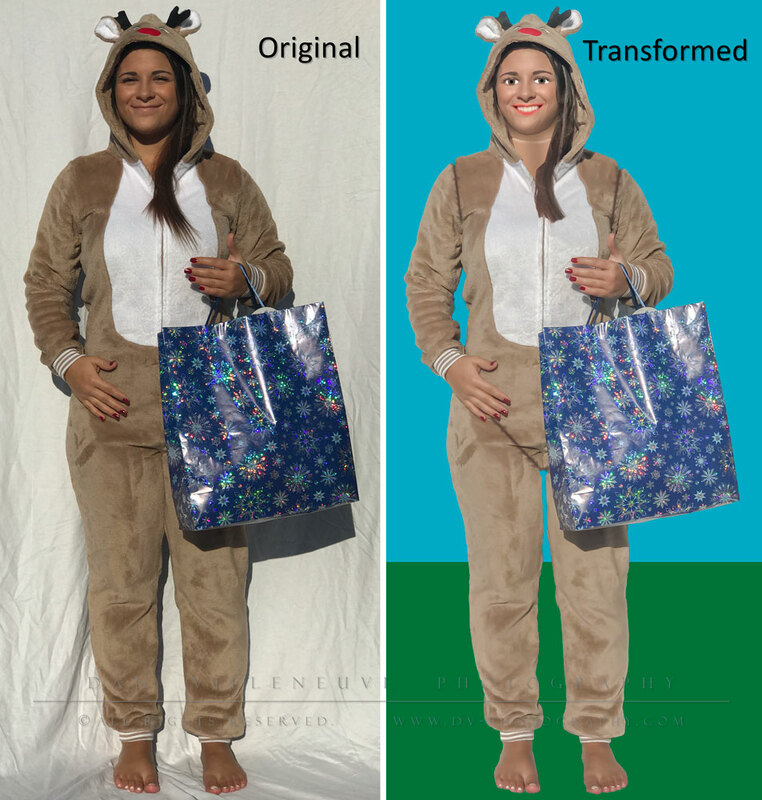 A very tight drop shadow is added using global lighting to give it that extra 3D effect. A quick edition tag line gets added to the bottom and things are coming along nicely! For me, the biggest challenge is how to make this look like the action figures are sitting in clear plastic. In this case we want to work from the backer card forward using multiple layers in a low opacity. The first layer I add is the part of the plastic that is glued to the backer card. 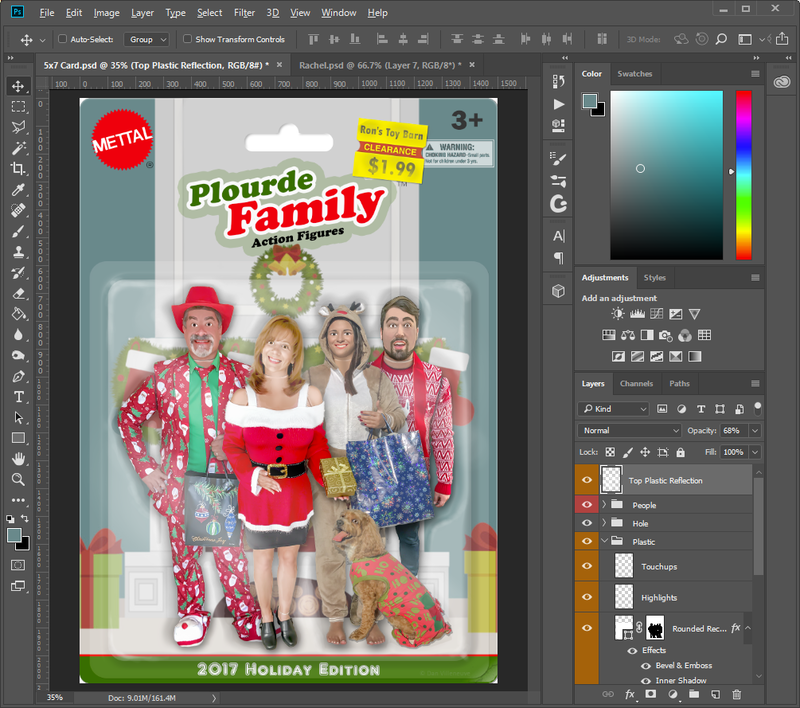 Using the Rounded Rectangle shape tool, I cover the area that the action figures occupy, being careful to be properly aligned to the edges of the card and not overlaying the title block. I add both a tight drop shadow and some embossing to give it some depth and set the layer opacity to 15% for a translucent appearance. Next we want to give the impression of the packaging coming off the backer card. I add a second Rounded Rectangle a little bit smaller than the first, adding an Inner Shadow and Bevel and Embossing to provide lighting and shadows so that it gives the appearance of depth approximate to the thickness of the action figures. I then set the opacity to 30%. 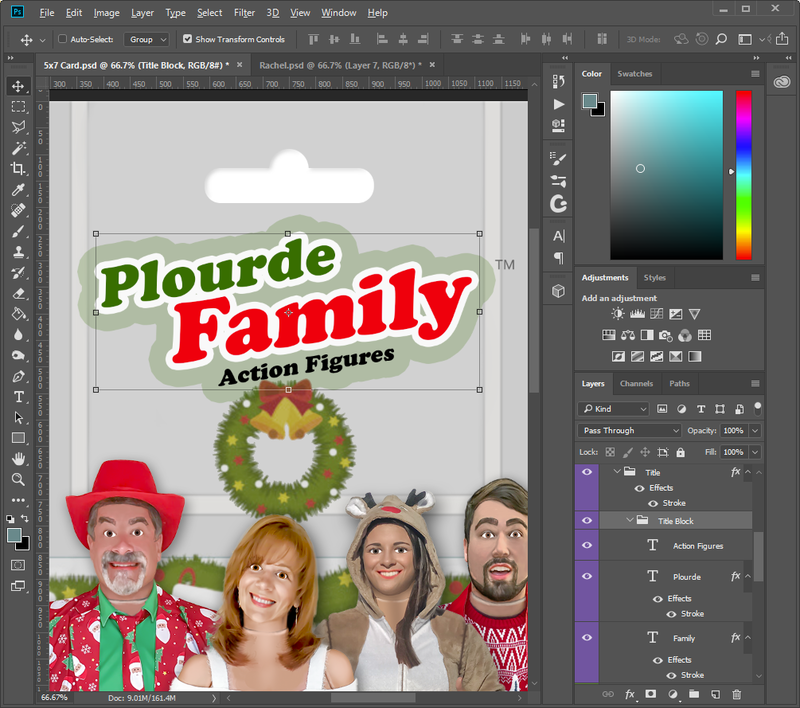 A layer mask is added and using the brush tool, I mask out the area where the action figures are. This creates a darker area around them giving the impression of a recess in the plastic. The end result is that the action figures now appear to be sitting in a plastic tray. Typically the plastic covering on action figures gets beat up a bit while on display. This will affect the reflections of the store lighting. To achieve this, I airbrush highlights on a new layer and adjust the layer opacity to let these highlights naturally blend. We’re almost there. The last step with the packaging is that we need to have the main reflections go over the figures so that it appears that there is plastic actually covering them. I add a new layer above the “People” group layer and using a large soft brush, I add the final reflections. After approximately 20 hours of work, the final product is here! I send the final review image to Ron and Julie. To say they are extremely happy with the results is an understatement. Honestly, the reaction I receive from them is the epitome of how I want all my customers to feel at the end of a project. This challenging project did push my creativity and organization in Photoshop to new levels. 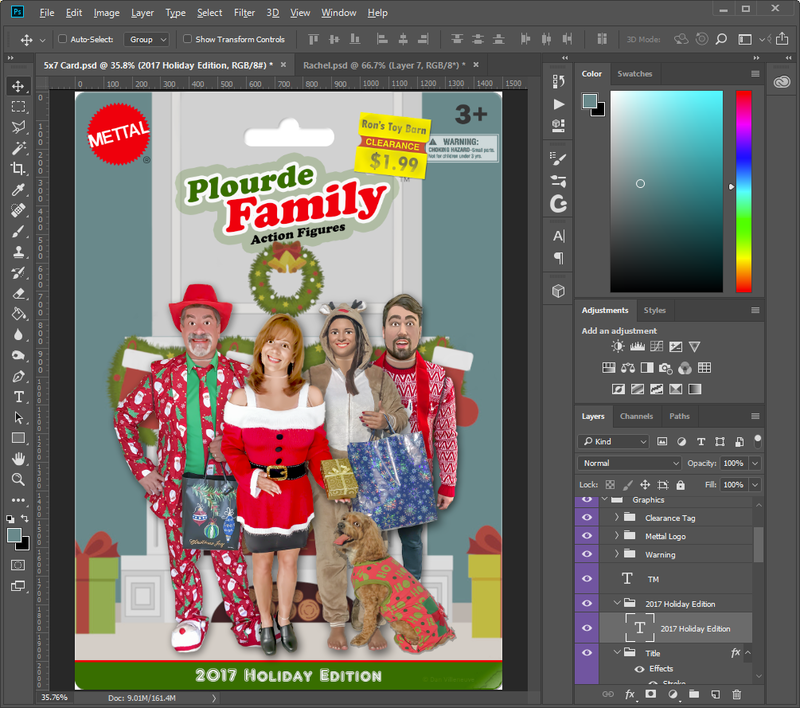 Most definitely I am glad I stepped up to the challenge and am happy that the Plourdes are thrilled with this year’s Christmas Card. A huge “Thank you” goes out to them for placing trust in my skills. It has been a pleasure doing this for you! The final printed card arrives in Florida. Photo courtesy of Julie Plourde. All images are © Dan Villeneuve Photography. All rights reserved. No replication or reuse is allowed without expressed written consent. This entry was posted in Experiences, Projects, Technique. Bookmark the permalink.